Looking at its storefront, you wouldn't expect Zume pizza to be the kind of business gunning to revolutionize the food-delivery business. Tucked into a quiet commercial park in Mountain View, California, next to a defunct flower shop -- which now serves as the company's engineering bay -- Zume looks more like the countless IT startups that dot Silicon Valley than a pizzeria. But only from the outside. One look in the building's kitchen facility belies its benign facade: Instead of chefs tossing dough and slopping sauce, the company has installed a human-robot hybrid workforce that can crank out as many as 400 pizzas an hour and can reportedly have them to your door in a fraction of the time (and price) as the competition. "One of the things that we have always focused on is how to create a system that works for both parties," Zume Pizza co-founder Julia Collins, told Engadget. "How do we create a system that's stable and predictable, which are great conditions for machines, but flexible and collaborative, which are great conditions for human beings?" Zume does not operate like conventional delivery services. Rather, it has sought to achieve a productive balance between its meaty and metallic employees, enabling each to better support the other. "Human beings are better at taste-testing," Collins said. "Human beings are better at recipe development, produce selection. Robots are great at repetitive tasks -- like moving pizza in and out of an 800-degree oven 1,000 times a day -- so the goal is not end-to-end automation because that's not what's going to create better food for the customer." 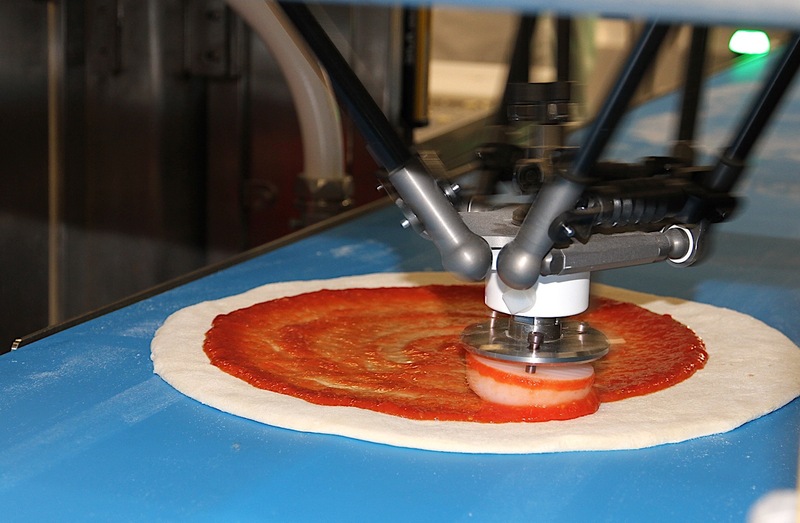 The robotic pizza-making process mirrors the traditional method, albeit with a few high-tech twists. 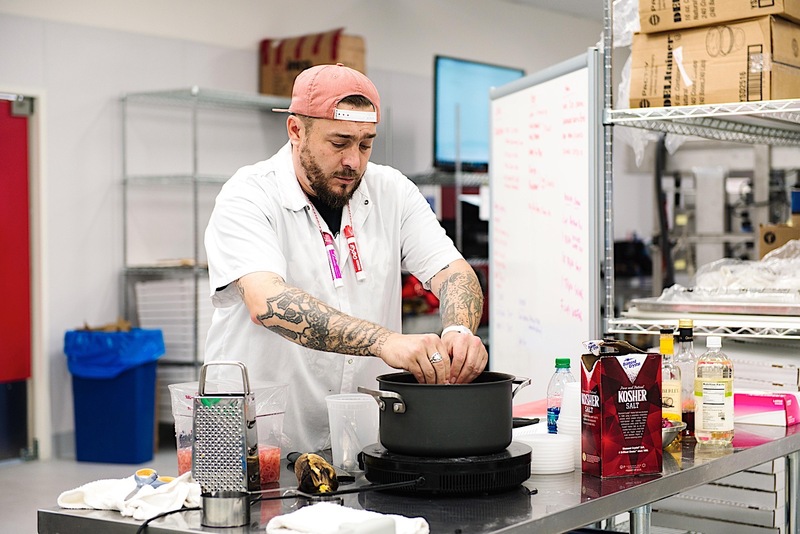 Rather than hand-toss dough balls into their circular pizza shape, which can be tiresome and mind-numbingly repetitive for human chefs, a customized hydraulic press, dubbed Doughbot, smashes the ball into shape. The pizza crust then travels down a conveyor belt to the saucing station, where a pair of extruders named Pepe and Giorgio slather the dough with marinara or alfredo sauce. From there, a fourth robot named Marta uses a multi-axis arm to evenly spread the sauce. The pizza then continues along the conveyor to the topping station -- one of the few steps in this process where human hands are involved. "We actually looked initially at having robots do that task," Collins said. "Then as we moved into the engineering work and the design involved realized we're going really far down a rabbit hole that wasn't necessarily going to create more value for our customers or a safer job for our employees. 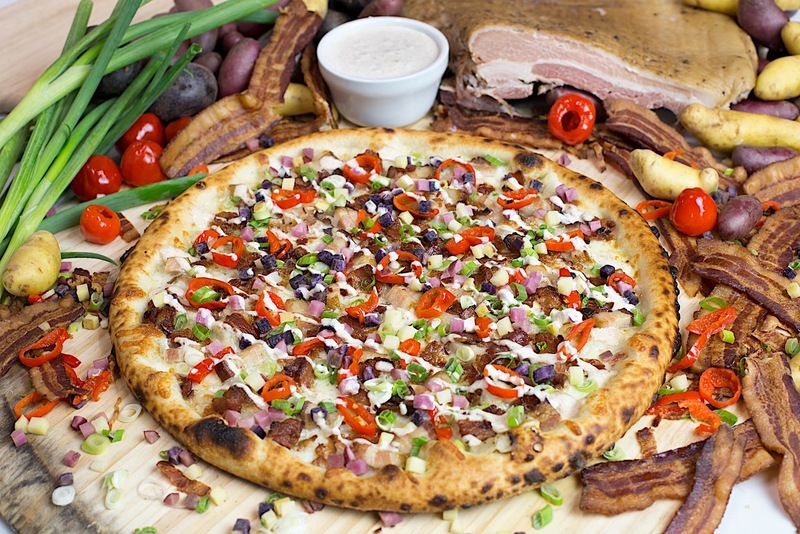 ... [But] something like toppings has a lot of diversity; there's a lot of joy in sort of dressing up a pizza. If it's not better for our workers and it doesn't create more value for the customer, then, really, what's the point?" 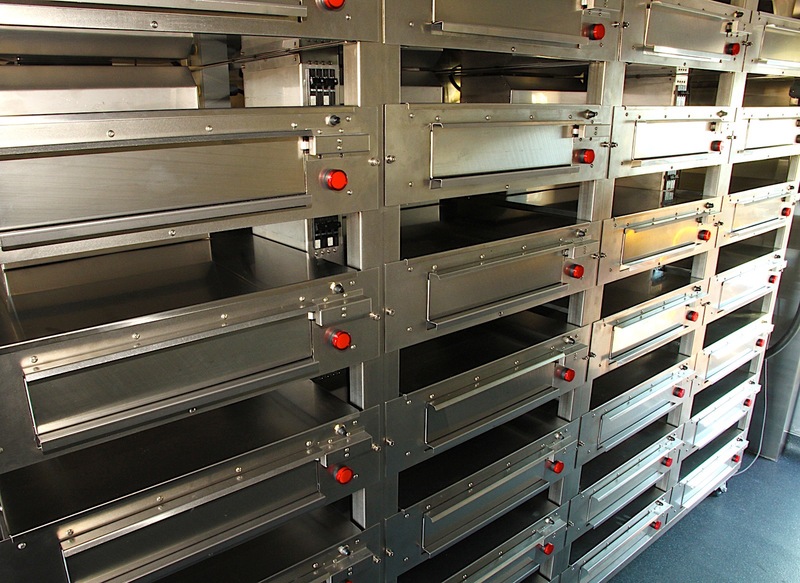 Once the pizza has been properly prepared, it is picked up by a modified six-axis robotic arm named Bruno (originally designed to stack pallets), and set into an oven for what the company calls the "par-bake" or partial baking. The pizza isn't fully cooked to start, a la Papa Murphy's, and for good reason: Par-baking essentially freezes the dough-rising process as the pizza is delivered. "Bouncing around the [uncooked] yeast will actually deactivate it, and then you'll be cooking a tortilla," Collins said. Once the pie comes out of the oven, Leonardo, the chopping bot, will slice it into eight even pieces using a 200 psi cutting press and it will be loaded into one of the company's delivery vehicles. But these aren't run-of-the-mill delivery vehicles. Each is roughly the size of a FedEx van, their interiors lined with as many as 56 miniature ovens. Using a GPS-based predictive algorithm, each oven will turn on and fire the partially cooked pizzas for the final four minutes before the truck arrives at the drop point. Once the pizza is ready, it ejects from the oven like a CD from a car stereo, into a waiting box (itself made from sugar-cane fiber and specially designed to ensure the crust stays crunchy) for the trip to the front door. This leads to some tricky logistical challenges because demand for pizza tends to be really spikey. Roughly 50 percent of Zume's order volume occurs between 5PM and 8PM, Collins told Engadget, and there are a number of factors that will affect demand. "We're looking at past order data. We're also looking at season, time of day and any cultural events that might be happening that could lead to a spike in sales like maybe the Silicon Valley premiere or the Game of Thrones premiere." When the company becomes swamped in orders, the delivery truck can convert into a localized hub. "When we get incredibly busy," Collins said, "the truck goes into what it's called a 'forward deployment mode.' So the truck essentially fixes in its location, and additional resources like scooters and cars come help to fill the last mile of that delivery." The truck acts as a miniature neighborhood pizzeria with par-baked pies being delivered to the truck from the central storefront and then delivered to nearby residences via car or scooter after they've finished cooking. With this system, the company should be able to take advantage of the higher population densities of cities by simply parking a van in each neighborhood, supplying them with pies from the central kitchen and then shuttling out the finished orders using smaller vehicles. In this way, Zume could theoretically cover an entire city with delivery service without having to build brick-and-mortar storefronts in each neighborhood. The company also says it's working to address the issue of food deserts, which the USDA defines as any low-income census tract in which more than a third of the population lives more than a mile from the nearest supermarket. In fact, according to the USDA's Food Desert Locator, 10 percent of the country's 65,000 census tracts met those criteria, and of the 13.5 million people without access to healthful food, 82 percent lived in urban areas. "When we move into a metro area, our goal is to win that entire area," Collins said. "We're not going to carve out pockets where we don't serve. We're not going to prioritize places where we do serve." Zume may be first on the field, but these logistical and mechanizing trends are beginning to take hold to the rest of the pizza industry, which rakes in $40 billion annually in the US alone. In fact, practices like prediction and inventory delocalization (also known as "cross stocking") are already being used by the likes of UPS, DHL and Amazon and may soon spread to Domino's, Pizza Hut, Little Caesars and Papa John's, which collectively control 40 percent of the delivery market. "Many people are doing the same thing that we're doing," Collins said. "We're just doing it to get better food onto your table."